By Jay Hirabayashi, Holly Yasui, and Karen Korematsu. Cross-Posted from Stop Repeating History! Our fathers, Gordon K. Hirabayashi, Minoru Yasui, and Fred T. Korematsu were among the 120,000 persons forcibly removed from the West Coast, deprived of their homes, property, liberty, and livelihoods by a government that claimed that national security superseded the Constitution. They trusted that the courts would fulfill their constitutional duty of asking probing questions about the government's assertion that incarcerating persons based on ancestry or national origin was justified as a military necessity. Instead, a Supreme Court majority ruled against our fathers in all three cases, essentially "rubber-stamping" the military's bald assertion that the mass round-up was reasonable and necessary. In doing so, the Court abdicated its critical role in safeguarding fundamental freedoms guaranteed by our Constitution. In contrast, a minority of dissenting Justices stood on the right side of history and rejected the government's position, including Justice Robert H. Jackson who referred to the majority's decision in Korematsu v. United States as a "loaded weapon ready for the hand of any authority who could bring forward a plausible claim of an urgent need." Plainly speaking, Justice Jackson meant that without evidence, charges, or trial, an entire racial population could lose their freedom and their rights merely because the government declares them to be a threat to national security. 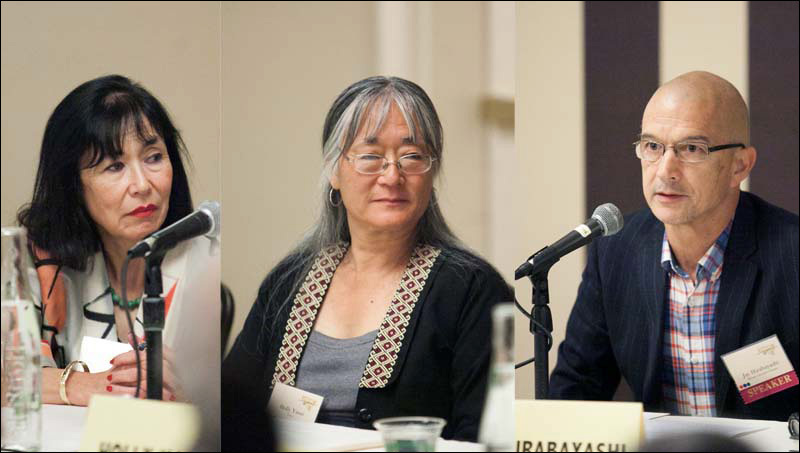 Hirabayashi, Yasui, and Korematsu were vindicated four decades later when it was found through coram nobis (findings of judicial error) proceedings that the government deceived the Court by withholding evidence that would have exonerated not only the three men, but all persons of Japanese ancestry who were imprisoned behind barbed wire. The evidence included intelligence reports from the Navy, FBI, and the FCC that categorically denied that Japanese Americans had committed any wrong or posed any threat. Other Justice Department memoranda characterized the Army's claims that Japanese Americans were spying as "intentional falsehoods." These and other official reports were never presented to the U.S. Supreme Court, having been intentionally suppressed and, in one case, destroyed by burning it. Today, our country is still infected by racism, xenophobia, and intolerance. And once again, the government is using the invocation of national security to justify imposing a sweeping ban on travel from six Muslim-majority countries, resulting in Americans being separated from their families, refugees fleeing war-torn regions being barred from entry despite having been stringently vetted, and American institutions being denied the services of visiting experts and scholars. As President Donald Trump is asserting that Executive Order 13780 is not reviewable by the courts, his claim to unbridled Executive authority is the "loaded weapon" that Justice Jackson predicted. Fortunately today, we have courageous public officials willing to challenge a President's unconstitutional overreach, jurists who understand that no President is above the law, and activists protesting the cruel and irrational position of the administration. We will make our voices heard through an amicus brief that we just filed today. But we will not limit our challenge to a legal filing. We're asking everyone to add their voices to a chorus of opposition against a government that seeks to unravel our true American values of fairness and opportunity for all, due process, and equal justice under the law. Educators and activists: teach and inform students and members of your community with more accessible and in-depth learning activities about the incarceration. We have come a long way from a period in our history when most Americans were unaware that the mass incarceration of Americans of Japanese ancestry occurred at all. Today, it is still only a few who know that the government manipulated the outcome of our fathers' landmark U.S. Supreme Court cases by knowingly presenting falsehoods and fabrications. We still have much more work ahead of us, especially in connecting the dots between the 1940s incarceration and today's threats to our civil rights. Sign on to this Call to Action. This post was originally published at Stop Repeating History!